AUTHOR INFORMATION: This novel by debut author David Tallerman was published by Angry Robot in early 2012 with book number two following in October 2012. David Tallerman is a productive reviewer, and has written many short stories, published in markets such as Flash Fiction Online, Bull Spec, Lightspeed, and Digital Science Fiction. FORMAT/INFO: Giant Thief is 384 pages long. January 31, 2012 marked the North American Mass Market Paperback publication of the book via Angry Robot. The UK version was released on February 2, 2012. Cover art was provided by Angelo Rinaldi. OVERVIEW: “The sun was going down by the time they decided to hang me. 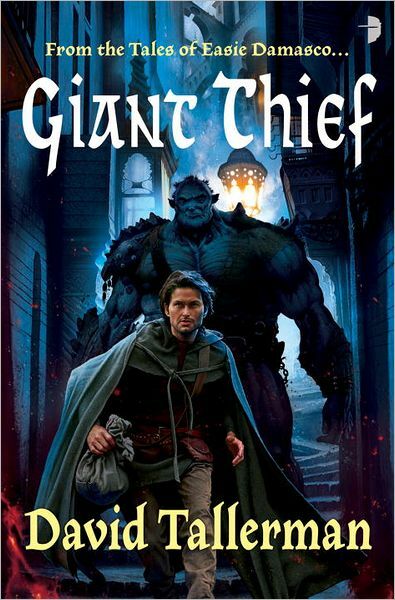 Giant Thief is the first volume in a trilogy following the adventures of thief Easie Damasco. A petty thief, selfish, and never at a loss for words, Damasco finds himself spiraled into a conspiracy that is bigger than him… Will he manage to overcome his nature to save himself, and his fellow travelers? Nearly hanged by commoners for stealing their food, Damasco is saved by Lord Warrior Moaradrid and forced to join his army. During his first battle, Damasco ends up commanding Saltlick—a very strong giant, who blindly obeys whoever is his chief. Seizing this opportunity, Damasco steals as much gold as he can in Moaradrid’s tent and leaves on the giant’s back. But why is Moaradrid so determined to get him back? It can’t be for the few pieces of gold he has stolen, or for the simple rock that came with them. Or can it be? ANALYSIS: Without a doubt, Giant Thief is an interesting book to read, thanks to its main character Easie Damasco, who is witty and charming, which creates many comical situations in the story as he finds himself dragged into an adventure that is “too big for him.” Aside from these humorous moments, the plot in Giant Thief is classical for a fantasy novel—with its share of fights, feasts, desperate situations and twists—yet genuinely enjoyable. As for the other characters, I found them a little pale and too single-minded to my taste. For instance, Moaradrid is just a one-dimensional villain, obsessed by his quest to become king of Castoval (but why? ); Estrada is heroic and self-sacrificing to the point of stupidity; and the giants are a mix of strength and blind obedience that I found credible, but lacking in originality. Yet the major problem with this novel is the world-building, which seems to come off as a fairly classical medieval fantasy world, but really isn’t described enough. As a result, I found myself slightly bored from time to time.